As winner of Best Pub in the Muddy Awards two year's running - this Hascombe pub is worth going out of your way for. 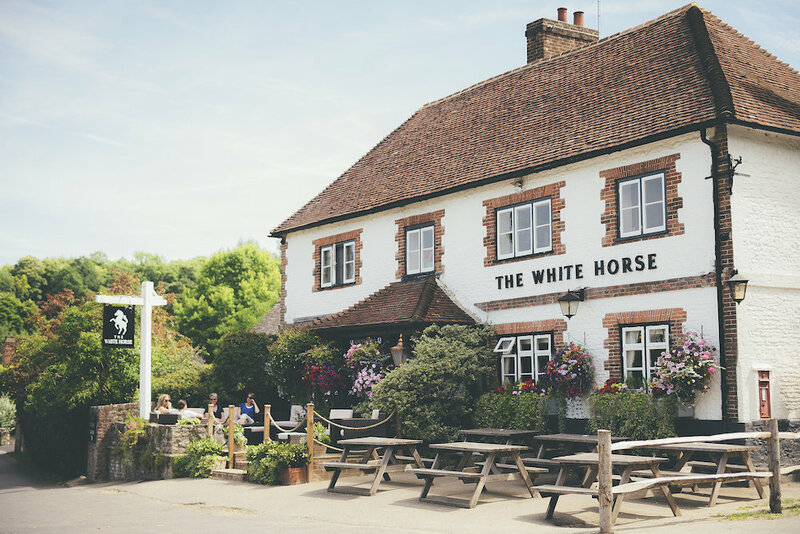 You’ll find The White Horse in the tiny village of Hascombe, just a few miles from Godalming. It’s a pub that’s been at the centre of this community for years, decades even, but in recent years it was clear it had seen better days. Step forward Paul and Sorrel Morganti, village residents and pub regulars, who – like knights riding in on their white horses – have stepped in to buy the pub (as you do!) and oversee a makeover that has transformed it into a pub and restaurant that’s making people take notice. 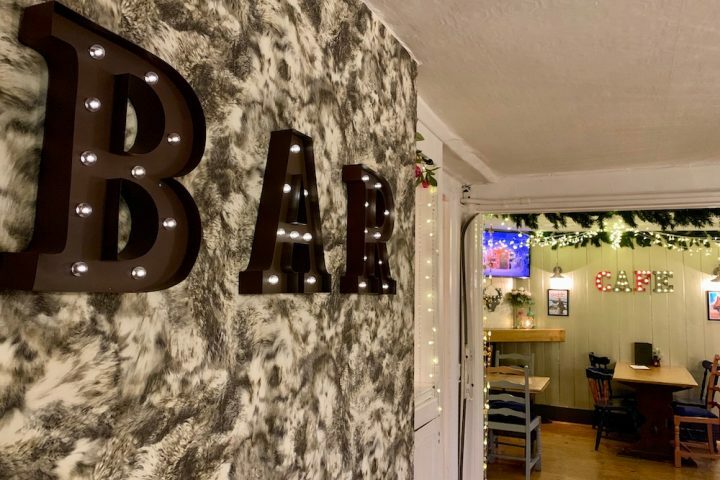 It was the 2017 Muddy Awards winner in not just the best pub category, but also best restaurant, and the 2018 winner of of best destination pub. The White Horse is a destination pub if ever there was one. But it’s also managed to tame that tricky beast of catering to its loyal flock of locals, as well as attracting people from further afield. One visit here and you’ll see why. 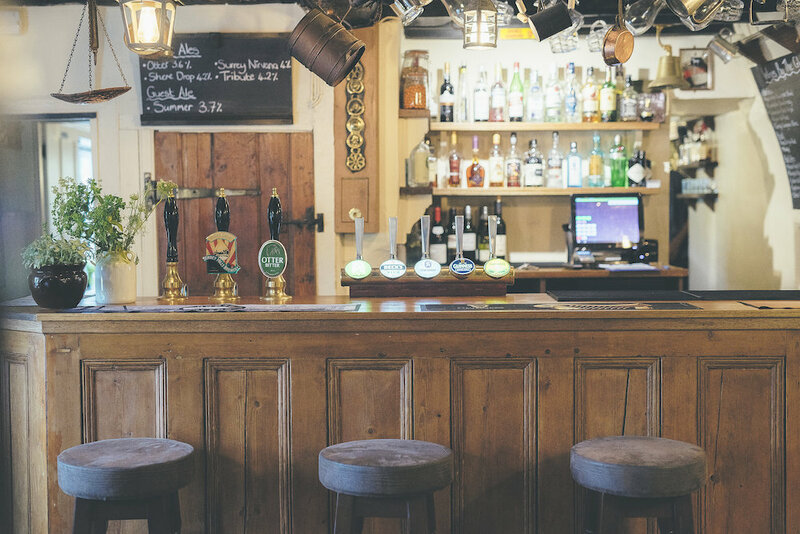 The pub has three very distinct areas: the chic Dining Room, the more casual Saloon dining room and the bar. The bar is where you’ll most likely find the locals. Outside there’s a gorgeous terrace, which extends to a grassy area with more casual picnic tables dotted among lovely specimen trees. There are also tables and seating at the front of the pub. It’s not often I get to enjoy lunch with the owner of a pub, but for my visit to The White Horse I had the delightful company of Mr Morganti. It’s quite clear that The White Horse is more than just a business venture for this couple. They’re passionate about retaining their ‘locals’ pub, but also about offering a menu that’s above the gastropub standard. Head chef is Valentino Gentile, former Executive Chef at The Restaurant at Tante Marie in Woking, and he has put together a menu which makes the most of locally sourced produce – vegetables comes from Secretts farm shop (another Muddy award winner) just down the road in Milford, meat is from Surrey and West Sussex farms and fish from the English south coast. Valentino is inspired by Italian flavours, and you’ll see a Mediterranean twist to some of his dishes. 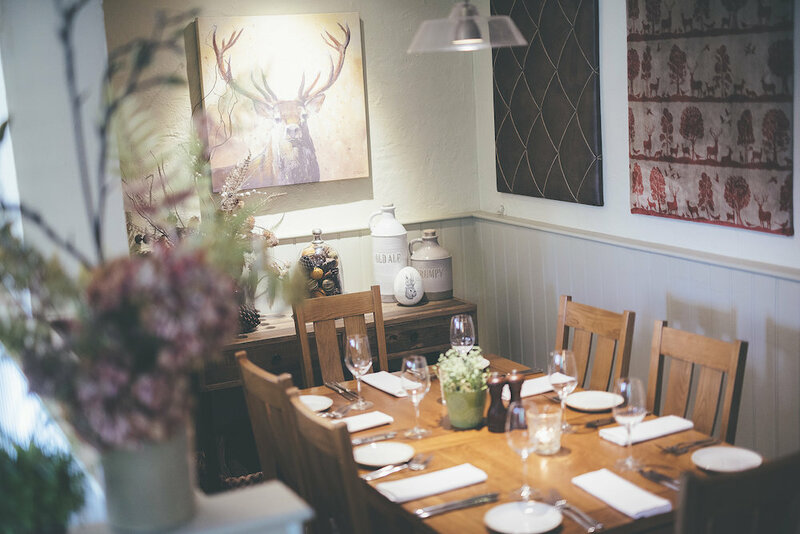 The à la carte restaurant is open in the evenings from Wed – Sat, while the pub dining menu consists of traditional pub classics and seasonal specials. When I visited – a gorgeously sunny and busy Friday – Valentino offered to prepare a collection of dishes for us to try – a sort of tasting menu designed especially for Muddy. Obviously, I jumped at the chance and what followed was a delicious and decadent five course lunch washed down with superb rose wine. 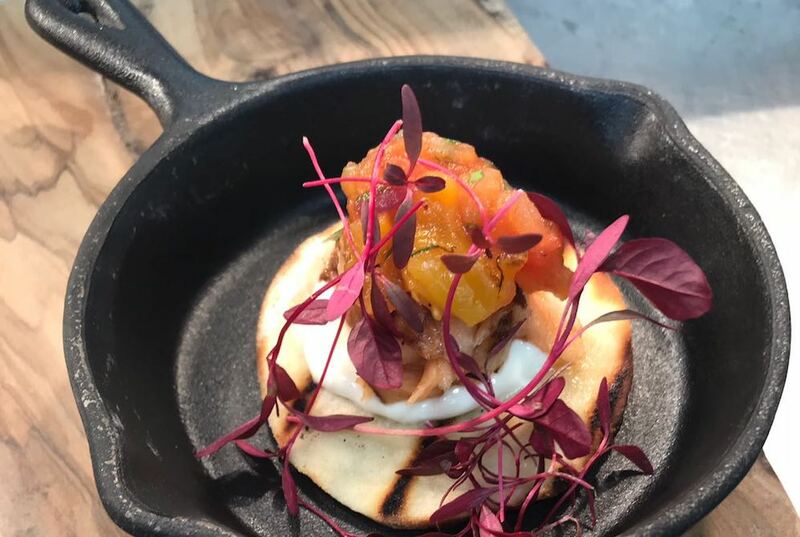 We started with an amuse-bouche of hot smoked salmon on homemade flatbread with a roasted pepper salsa and yoghurt. It was simple, elegant and delicious. 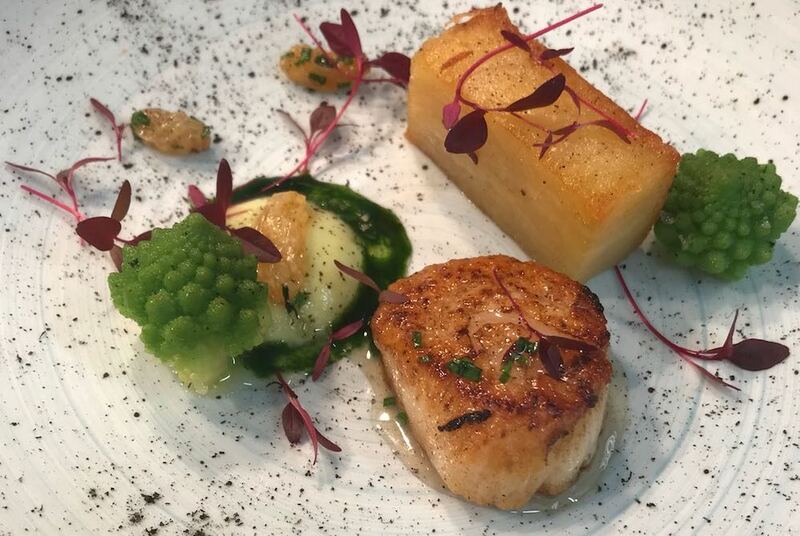 Our next dish was a scallop starter with a lavender smoked potato terrine – and again the same three words come to mind. Simple. Elegant. Delicious. I can sense a theme to this lunch. We moved on to course number three: wild garlic gnocchi with a potato skin fondue. Again, flavours were delicate and simple. And very very tasty. 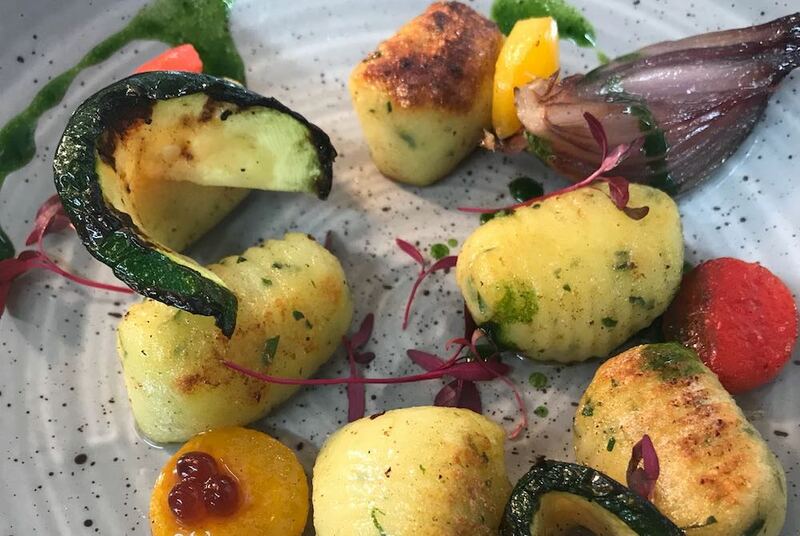 The wild garlic for this dish was about as local as it possibly could be – having been sourced from the Morganti’s own Winkworth Farm. Next up, was our final savoury course – Norwegian skrei cod with a bouillabaisse, tabouli and mussels. Skrei cod is protected by a set of quality guidelines and as such has an exceptionally short season, running to just six weeks, so it’s only available now. 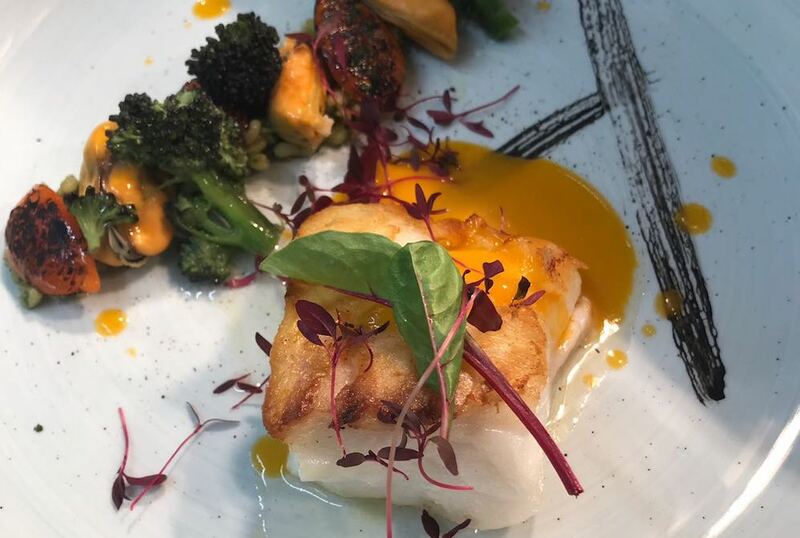 It’s one of the few fish on The White Horse menu that’s sourced outside the UK, and it really is something special, with a very delicate flavour yet a meaty texture. 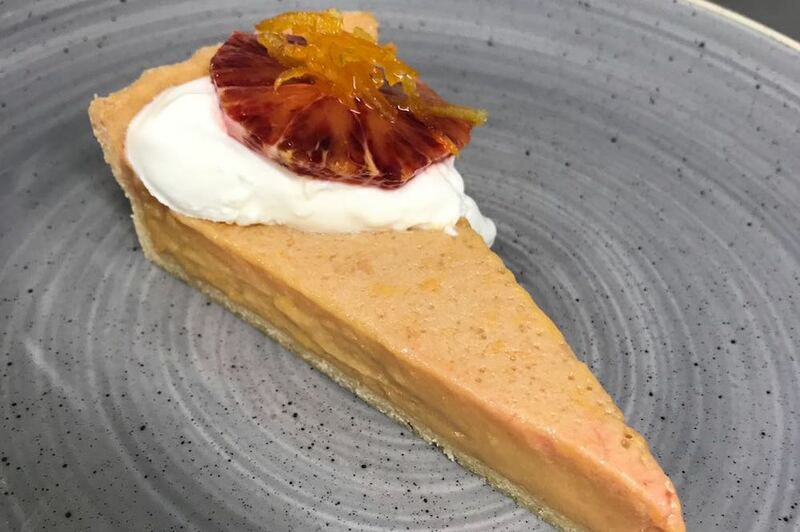 Our final and fifth dish was pudding: a blood orange tart. Beautifully presented, and again with delicate flavours. It was the perfect pud for a sunny Friday afternoon. 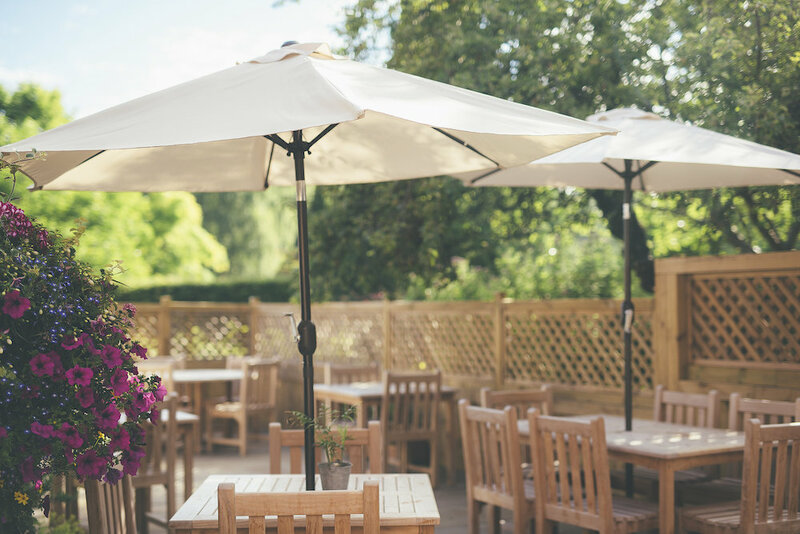 The Dining Room is a kid-free zone (at least for the little ones under 10), but the Saloon dining room and certainly the garden is the perfect spot for families. Dogs are also welcome in the garden, Saloon and Bar. In fact, the local dogs are so welcome they each have their own personalised bowl kept behind the bar – it’s touches like this that speak volumes for this pub. If you fancy something more invigorating than a stroll around the village (the Victorian St Peter’s Church a hundred metres down the road from the pub is worth a peek though), there’s a three mile circular woodland iFootpath walk that encircles Hascombe Hill and starts just across from the pub. 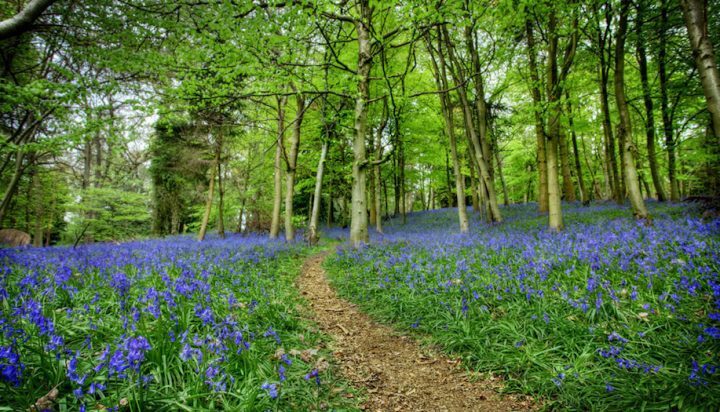 The National Trust’s Winkworth Arboretum is just a mile away – and well worth a visit at any time of year, but especially when the bluebells are out. Good for: If the sun’s shining the garden here is perfect for family gatherings, groups of friends, couples, walkers, people with dogs… just about everyone. Inside, the Dining Room would suit a special occasion, groups of friends getting together or couples looking for a romantic dinner for two. 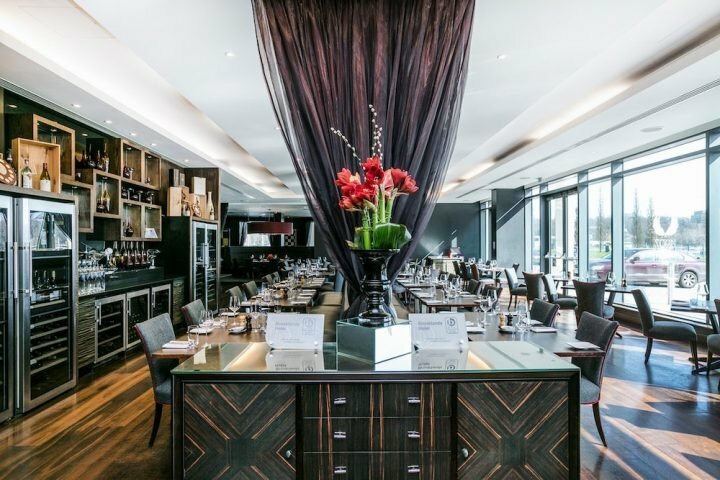 Not for: A speedy, light lunch – the food is cooked to order and gorgeous, and the setting is superb , so make the most of it and the brilliant wine list. The damage: In the pub, light bites are from £7-£9. Mains: £13-£16.50 and puds are around the £7 mark. The Dining Room menu starts at £7-£10.50 for starters, moving to £16-£22 for mains and £7 for puds. A six course tasting menu is available in The Dining Room for £45 a head. 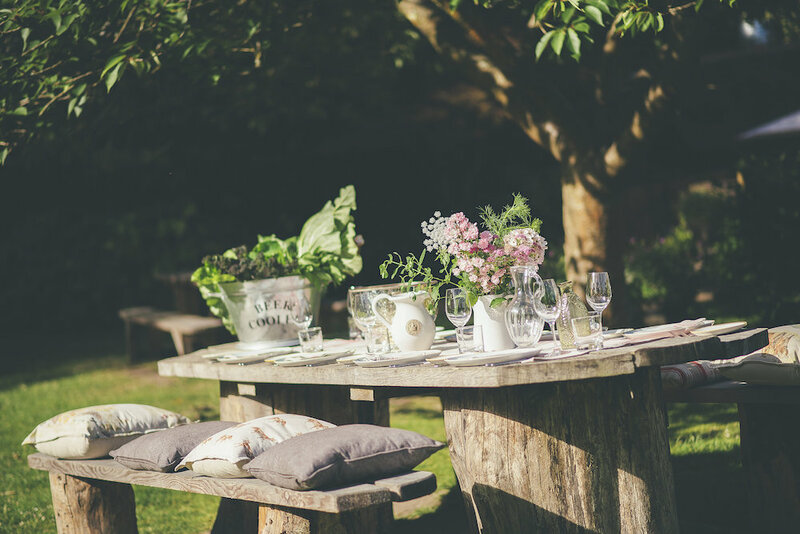 It is a wonderful all round experience…I can’t think of a better place to celebrate a special occasion or just enjoy a pleasant lunch in idyllic surroundings, Not forgetting a superb dinner in an elegant dining room having enjoyed a pre- dinner drink, in the Bar. For us this is one of our most favourite places in the world….. I have been a number of times, infact, I was there last night for a light early dinner with work colleagues. Staff are always welcoming and all our food was absolutely delicious.